VATICAN CITY (CNS) — Pope Francis began the New Year praying the world would demonstrate a marked increase in solidarity and welcome for migrants and refugees. “Let’s not extinguish the hope in their hearts; let’s not suffocate their hopes for peace,” the pope said Jan. 1 before reciting the Angelus with a crowd gathered in St. Peter’s Square. For the New Year’s celebration of World Peace Day and the feast of Mary, Mother of God, Pope Francis had chosen to focus on migrants and refugees and their yearning for peace. “For this peace, which is the right of all, many of them are willing to risk their lives in a journey that, in most cases, is long and dangerous and to face trials and suffering,” the pope told an estimated 40,000 people gathered in the square around the Christmas tree and Nativity scene. “All life, from life in the mother’s womb to that of the elderly, the suffering and the sick, and to that of the troublesome and even repellent, is to be welcomed, loved and helped,” he said. Pope Francis also drew people’s attention to the fact that in the Gospel stories of Jesus’ birth, Mary is silent. And the newborn Jesus, obviously, cannot speak. “We need to remain silent as we gaze upon the crib,” he said. “Pondering the crib, we discover anew that we are loved; we savor the real meaning of life. As we look on in silence, we let Jesus speak to our heart. “May his lowliness lay low our pride; his poverty challenge our pomp; his tender love touch our hardened hearts,” the pope prayed. Celebrating evening prayer Dec. 31 and offering thanks to God for the year that was ending, Pope Francis gave a special acknowledgement to people — especially parents and teachers — who are “artisans of the common good,” working to help their families, neighbors and communities each day without fanfare. 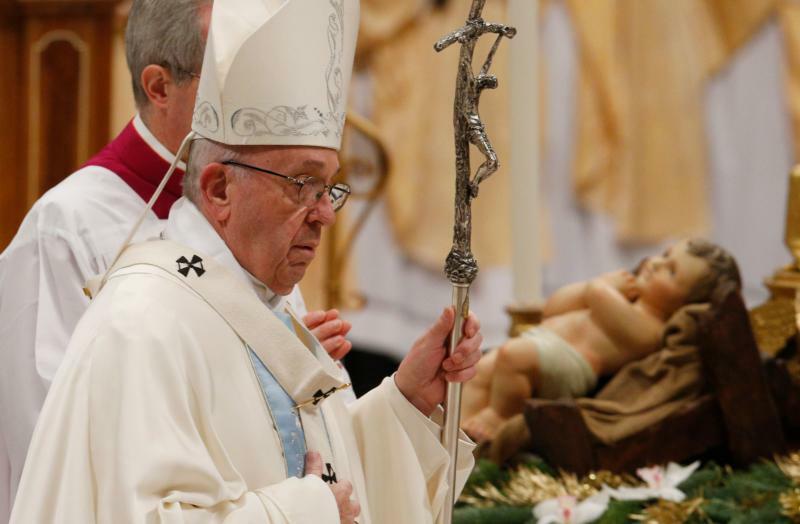 The pope also led the midday Angelus prayer Dec. 31, the feast of the Holy Family. The Sunday Gospel reading recounted Mary and Joseph taking the baby Jesus to the temple “to certify that the child belongs to God and that they are the guardians of his life and not the owners,” the pope said.